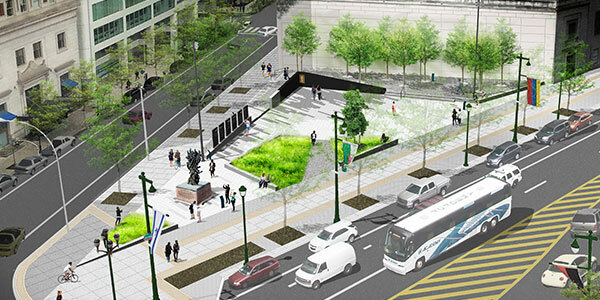 The ceremony is usually held at the monument at 16th Street and Benjamin Franklin Parkway, but expected rain moved it to Congregation Rodeph Shalom. (Despite the forecast, it turned out to be a beautiful sunny day). More than 300 people attended, with representatives from the Jewish community as well as other religious leaders and elected officials, including Mayor Jim Kenney and Rep. Dwight Evans (D-District 2). The ceremony included speeches from local dignitaries; prayers and songs led by Nashirah, the Jewish Chorale of Greater Philadelphia, and ChaiLights A Capella; a keynote address by Kenneth Jacobson, deputy national director of the Anti-Defamation League; and remarks from survivor Manya Frydman Perel. Teens walked down the aisle toward the bimah and laid down white flowers to represent children who perished. As first-person accounts of the Holocaust are becoming more scarce, Jake Sztejman, co-vice chair of the Philadelphia Holocaust Remembrance Foundation (PHRF), said it is more important than ever to hear and remember these stories. Both of his parents were Holocaust survivors, as were his wife’s parents. His father was born and raised in Poland. During German occupation, he escaped a ghetto but ended up in Siberian work camps, where he met and married Sztejman’s mother. After the war, they lived in Poland until 1962 when Sztejman was 15, then immigrated to the U.S.
Mim Krik tells a similar story. Krik, president of the Children of Jewish Holocaust Survivors Association and board member of PHRF, is the child of survivors, as is her husband. Her father was born in Paris but moved back to Poland, growing up in an orphanage. He later joined the Polish army but was captured and taken to Siberia. He eventually escaped and joined the underground movement. Her mother was born in Poland and lived there until the German occupation. “Selection day came and her and her sisters were torn from their mother’s arms and put on a truck to a work camp,” Krik said. After liberation, her parents met, married and moved to Philadelphia. Sztejman said it made the April 23 event that much more important. “It’s more important that people are made aware what can happen when a few bad people can influence that,” he said. Krik said she will continue to do everything in her power to honor her parents’ memories and what they set out to accomplish in their lives after the war. “My parents had 18 great-grandchildren — that’s an accomplishment,” she noted enthusiastically. Both Sztejman and Krik highlighted a commonality among children of survivors: They grew up without grandparents. “It’s very important for me to be very involved in [my children and grandchildren’s] lives because of that,” Krik said. Not being at the monument made a difference in the ceremony, Krik added, as it has a major impact on the event itself. But Jake Reiter, board member of PHRF, said though a different location was not optimal, the focus remained on remembrance. 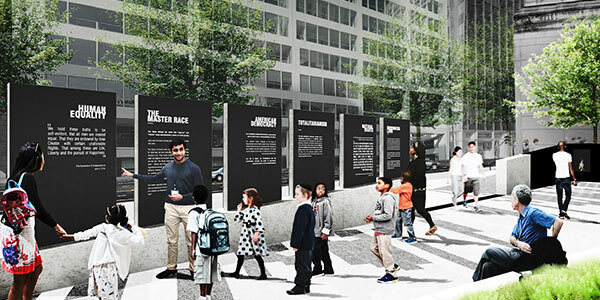 At the monument site, the PHRF is expected to have the Philadelphia Holocaust Memorial Plaza completed by 2018, which will include interactive virtual tours of the park with firsthand testimonials. 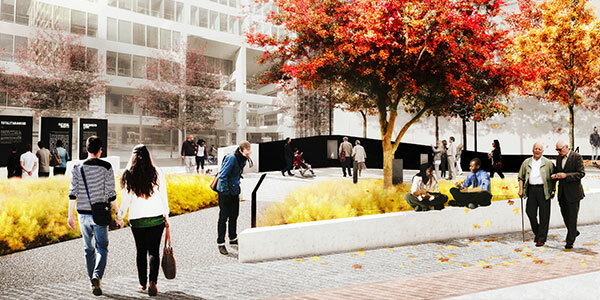 Through an app, users will be able to see the memorial wall and virtual railroad tracks, giving the user the experience of a trip from a small village to a concentration camp. “For example, my family lost eight families in a small town in Hungary,” Reiter said. “They were hustled onto a railcar and taken to Auschwitz where they were exterminated. So I can go with my children and, in a less dramatic fashion, obviously, share that experience on my iPad with my kids. Samuel Swerdlik was 12 when he endured several concentration camps, though he has since forgotten their names. The 89-year-old’s eyes swelled with tears as he spoke about his own experiences. He recalled his moment of escape. He survived alongside an older sister, and said he just hopes people never forget the atrocities. “Even today, with all the books and all the movies we have, some people say that [the Holocaust] never happened,” he said. Swerdlik, treasurer of the Association of Jewish Holocaust Survivors, and his wife lit a candle in honor of the victims during the ceremony.